Aside: Which Children’s TV Character Are You? I was told yesterday my adventures are reminiscent of a small man in a bowler hat and a smart black suit. Mr Benn used to walk a long the road to the costume shop, choose an outfit and get changed. He always left the fitting room by a magic door and thereby enjoyed an adventure suited to his costume. Now I need to be absolutely clear – my adventures involve NO DRESSING UP okay? the nearest I come to this is donning colour coded gloves for kite flying (red for the red handle and blue for the blue handle – just chance the gloves came as a two pair pack – one pair in red and one in blue). I also don’t wear a bowler hat – never! However I suppose the comparison is not a bad one – Mr Benn’s portal was a magic door – mine is Stagecoach buses. 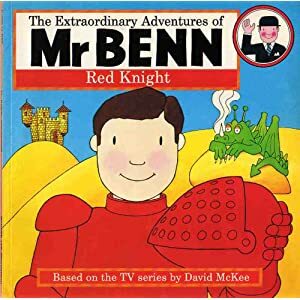 I also suppose I should be grateful it was Mr Benn I am compared to … it could have been Mrs Wooden Top or Florence from the Magic Roundabout … happy days when children’s programmes were, well children’s programmes! Thank you for this happy analogy … it made me smile and that makes me more serene. So which Children’s Programme Character might you be likened to?